Old Mountain Farm sits on the shoulder of Mt. Agamenticus in Cape Neddick Maine on property that was settled by Cheryle's ancestors in the early 1700's. Cheryle remembers, as a little girl, visiting her grandparents at the Old Mountain Farm. Cheryle and Wyl raise show quality milking Nigerian Dwarf Dairy goats and have been doing so since 1994 although Cheryle has been working with or owning goats since 1975. 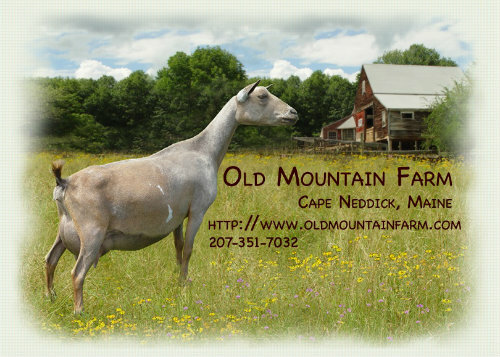 The farm supplies, delicious raw milk, organic fertile duck eggs, Muscovy Ducks, Organic Chicken eggs, manure for composting, raw and processed goat hides. Workshops both group or private in topics such as butchering and goat disbudding.